While most people have heard of the gladiators of ancient Rome, far fewer know of those who fought in London and other places in the British Isles and British colonies during the seventeenth and eighteenth centuries. What followed these processions was violent and often gruesome. On the appointed day, to the sound of trumpets and beating drums, the two combatants would ascend the stage, strip to their chests, and, on a signal from the drum, draw their weapons and commence fighting. The combat would continue until one man conceded, or was unable to continue. In de Rocheford’s account, the combatants continue fighting while enduring horrific wounds, including severed ears, sliced-off scalps and half-severed wrists. Bouts occurred with different types of weapons, including longsword, backsword, cudgel, foil, single rapier, rapier and dagger, sword and buckler, sword and gauntlet, falchion, flail, pike, halberd, and quarterstaff. Although such fights were not intended to end in death, the wounds received were often serious enough to incur it. Years earlier, Stokes (under her maiden name Elizabeth Wilkinson) had bested a basket-woman named Hannah Hyfield in a bare-knuckles boxing match, and had later fought a fish-woman named Martha Jones, also with fisticuffs. Now, however, Mrs. Stokes proposed to enter a more dangerous sort of combat. Although I was not able to find an account of such a fight in 1725 (if the aforementioned challenge was indeed arranged), on October 1, 1726, “Mrs. Stokes,” it was reported, had found an able and willing antagonist in the person of Mary Welsh (or Welch). Much more has been written about the life and career of Mary Welsh, as well as of other female gladiators of the period, in the new book, Irish Swordsmanship: Fencing and Dueling in Eighteenth Century Ireland. You can also read extracts, view images, and read articles pertaining to the book and its subject by visiting the book’s Facebook page. Chambers, W. R. Chambers’s journal of popular literature, science and arts, Volume 59. London: W. R. Chambers, 1882. Her Passion was no less violent than his, and perhaps she express’d it, by one of the most generous Actions that ever Love inspired. It happened this young Fellow had a Quarrel with one of the Pyrates, and their ship then lying at an Anchor, near one of the Islands, they had appointed to go ashore and fight, according to the Custom of the Pyrates: Mary Read was to the last Degree uneasy and anxious, for the Fate of her Lover; she would not have had him refuse the Challenge, because, she could not bear the Thoughts of his being branded with Cowardice; on the other side, she dreaded the Event, and apprehended the Fellow might be too hard for him: When Love once enters into the Breast of one who has any Sparks of Generosity, it stirs the Heart up to the most noble Actions; in this Dilemma, she shew’d, that she fear’d more for his Life than she did for her own; for she took a Resolution of quarrelling with this Fellow her self, and having challenged him ashore, she appointed the Time two Hours sooner than that when he was to meet her Lover, where she fought him at Sword and Pistol, and killed him upon the Spot. – Capt. Charles Johnson, A General History of the Pyrates. Reprint of the 1724 edition. 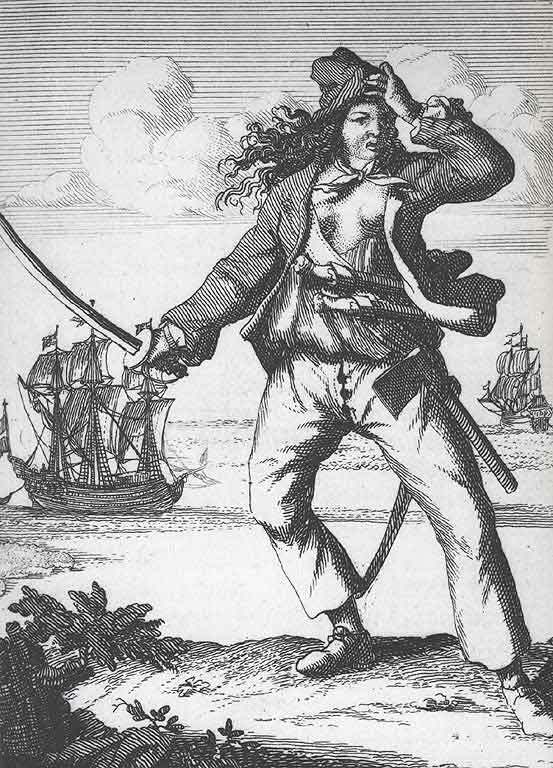 A vintage image of Mary Read. Note the fencing stance. The Best Defense Is a Good Offense... Really? The Best Defense Is a Good Offense… Really? Unauthorized use and/or duplication of this material without express and written permission from this site’s author(s) and/or owner is strictly prohibited. Excerpts and links may be used, provided that full and clear credit is given to the article's author and OutOfThisCentury with appropriate and specific direction to the original content.